When I was seven, I spent every day that summer at my Mumma's house in Karachi. Mumma was my maternal grandmother and really, everyone from the ancient gardener to the youngest grandchild called her Mumma. To call her anything else would simply offend her and no one wanted to bear Mumma's wrath. As far as her house went, I use the term house loosely, because it was more a palace, at least in my seven-year old eyes. Room after room, filled with shiny glass curios she and my grandfather had collected on their international travels, enough silk flowers and music boxes to rival an antique shop, and my personal favorite, a giant grandfather clock that chimed every hour. And every day at 4 p.m. on the nose, the clock would chime for chai. And aunts, uncles, and cousins would pour out of every crevice of that house and descend to the sitting room for their afternoon tea and gossip fest. To this day, I am not certain how many people actually lived in that house. All I know is that at 4 p.m., the sitting room was crowded, loud, and smelled faintly like Chanel No. 5. The relatives occupied every available seat, with the stragglers taking up places on the large floor cushions. Mumma presided over the clatter like a queen presiding over her court. She watched closely as the chai was poured from her bone china teapot decorated with English tea roses along the handle. This was no ordinary chai. Rather, it was chai that had bern simmering on the stove for a good hour, while my grandmother's cook slowly added milk and cardamom and cinnamon until the chai was creamy and fragrant. But afternoon chai was never just chai, you see. The table would groan under the weight of platters of tea sandwiches, plates of kebabs, and dishes filled with samosas. But even back then, my little hands were drawn to the cookies. Or as my grandmother called them, biscuits. Sometimes topped dried fruit, sometimes filled with sticky jam, and other times sprinkled with nuts. And while the others gravitated toward the savory dishes, I slowly pulled the plate of biscuits toward me until it was squarely in front if me like a dinner plate. Clearly, my love affair with cookies began early. 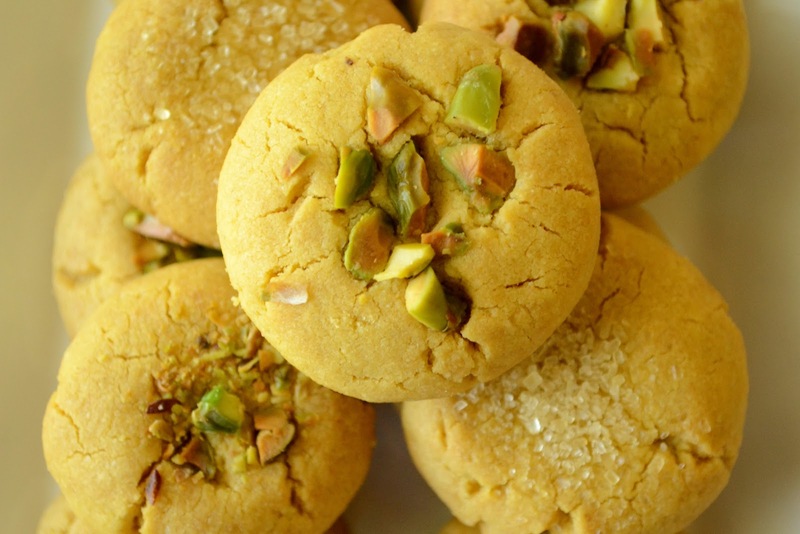 On the best of days, this pistachio cookie would be the biscuit of choice. And oh, what a biscuit it is. Perfectly crumbly from the semolina. Slightly salty from the salted pistachios. And lest you worry about the addition of gram flour, know that it adds the most wonderful caramelized nuttiness that goes so well with browned butter. If you don't believe me, bake up a batch and watch as the biscuit tops crack charmingly under the weight of sparkling sugar or even more pistachios. This is the perfect biscuit for book clubs and dessert parties, for Sunday brunches and lazy afternoons. And it is most certainly perfect for 4 p.m. chai time. Yields approximately one dozen large cookies or two dozen smallish cookies. Melt butter on the stove until golden brown. If you have not used brown butter in a recipe before, or if the you always end up in burned butter instead of brown butter land, read Simply Recipe's tutorial asap. Once brown butter is cool, add to a mixing bowl and beat in the brown sugar. 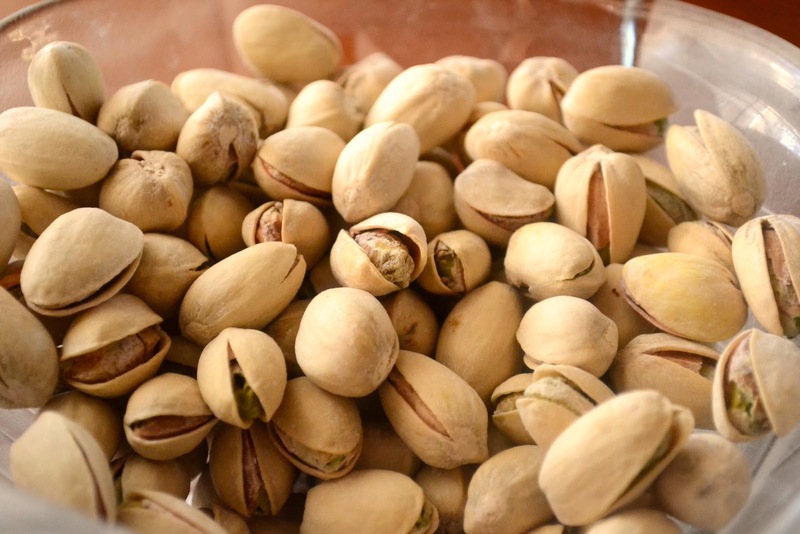 In a separate bowl, whisk together flour, semolina, gram flour, baking powder, and pistachios. Mix flour and butter gradually until dough forms. Knead until dough is smooth. If dough is too sticky, wrap dough in waxed paper and refrigerate for 20 minutes. If dough is manageable, there is no need to refrigerate it. Roll out balls of dough and place cookie sheet (and Silpat because gosh, my life has been so much better since I started using my Silpat regularly). Flatten dough ball slightly and top with chopped pistachios or sparkling sugar. Bake for approximately 20-25 minutes on the middle rack of your oven, until cookies are light golden. Cool. Devour. They look so so beautiful and yumm. I love cookies like this. What a nice looking cookie and what a great story to go with it. I admit I had to look up where Karachi was, so I even learned something today. oh yea I remember how those chai times were kind of a big deal..and even though I did not care much for chai, certainly loved cookies and other snacks! Loved this combo - sweet, salty..
Have a nice day. Regards. Those look delicious! Did you spend a lot of your summers in Karachi? I used to go to India and spend a lot of my summers with my family in the Northern villages that bordered Nepal. I love that I was able to experience such different cultures so early. Love how you talk about chai time. I also never knew how many people were living in any of my family's homes at any given time. lol. These look really similar to something my mom makes called (forgive the horrible spelling) naan kathi. Those are tasty and these look so good too! Some of the homes in Karachi really are palaces! Ameena, yes! It's definitely similar to a naan khatai minus the random spices like cardamom. And I think you might cream the butter and sugar to make naan khatai. But really, I think we need to try your mom's cookies to be sure ;) With chai! I miss that afternoon chai gathering at home with samosa, pakoda, biscuits and non stop laughter! Lovely flavorful cookies you baked out there. Cookies look super delicious...wonderful clicks. These look fantastic. The fact that the chai was brewing for practically *forever* (well for my inpatient mind) makes this cup of tepid coffee I'm holding right now, just look sad. I need this chai in my life! Would you be interested in sharing some sort of recipe? My parents LOVE chai. They used to drink it twice a day and have now cut it down to once after work! I'm sending my mom this recipe right now...she'd love it! Hmm, now I want to have a chai :) It's remarkable how certain foods can transport us back in time, to a different setting with unique smells of their own. I would love to make these cookies/biscuits! Where do you buy gram flour? I've only ever seen chickpea flour once (and it definitely wasn't around here, in the middle of nowhere lol :P). I wish I could have been hiding in one of those crevices of the house so I could have scurried out at 4. My love affair started early too and I've been thinking of these since you made them. I've book marked this one so I won't lose it. I have to find that flour, I may order it that way I don't have to wait so long to make these. Hope your New year is going good, just trying to get back into the rhythm of things. As it is I'm addicted to the flavour of brown butter, how I wish I'm having a leisurely chai time tho instead of the rushed coffee on the go! Bet the cookies taste nicer in the idyllic palace! I have never baked with gram flour before. I would love to try baking this new ingredient with this lovely recipe. Beautiful memories and such lovely cookies. Since pistachios (and certainly brown butter) are some of my favorite things...I can't imagine not LOVING these cookies. Thank you for sharing with us. I hope you have a great start to your week. Stay healthy, happy, and warm! You gotta bring back the afternoon chai meetings. Sounds like that's where the fun's at! Lovely cookies. The first recipe I've seen with semolina, which of course, I don't have any of. I loved these pistachio buiscuits. " Chai time" with these yummy treats? I am always ready!! I wish I could´ve gone to chai afternoons. This cookies are scrumptious! 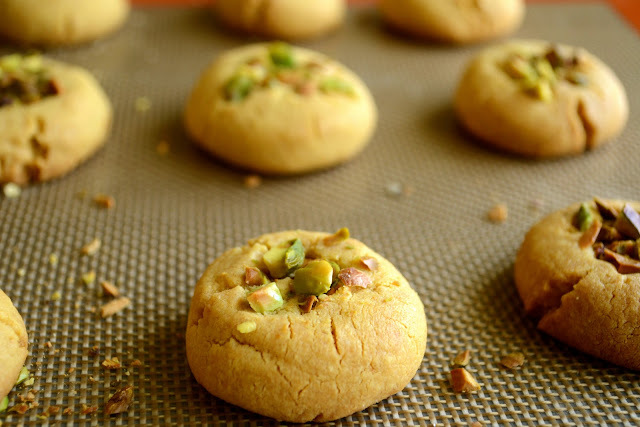 Pistachios and semolina are such favorites to bake with. Pinned! Realmente exquisito me encanta tiene un aspecto perfecto y delicioso,abrazos y abrazos.